Wedding toasts are a tradition that many guests and wedding participants look forward to. An opportunity for maids of honor and best men to express their feelings about the bride and groom, wedding toasts often touch on the heartfelt and the humorous while shedding light on the relationship between the happy couple and the men and women they have chosen to play such significant roles at their wedding. While guests might enjoy wedding toasts, best men and maids of honor may be nervous about honoring the brides and grooms in such public settings. That anxiety is perfectly normal, especially for those who have never before been asked to serve as maid of honor or best man. Those tasked with toasting the newly anointed husband and wife can consider the following tips to make the task a little easier. · Keep it brief. While there might be many things you want to say, try to express yourself as concisely as possible. Convey your relationship with the bride and/or groom, but avoid lengthy histories that might come off as rambling. While personal anecdotes that shed some humorous light on your relationship are great additions to wedding toasts, avoid going into too much detail when telling such stories, focusing instead on the parts of the stories that illustrate your feelings and generate a few laughs. · Avoid being too formal. 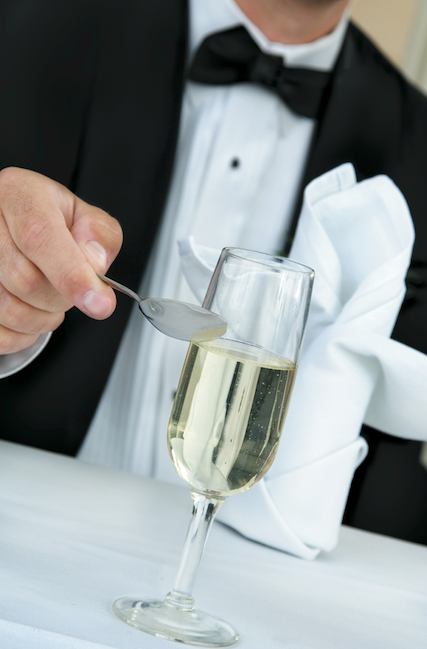 Even the most formal wedding can benefit from a toast that veers more toward the spontaneous. While you want to thank the parents of the bride and groom for hosting the wedding and the guests for being on hand to celebrate, don’t feel as though you need to be especially formal. Giving a less formal speech also may help calm your nerves. · Practice, practice, practice. Practice your speech ahead of time so you are not reading from cards or notepads during the toast. Reading from a piece of paper is less likely to engage the audience than if you are speaking to them directly and sharing some heartfelt thoughts about the bride and groom. It’s alright to hold onto some cue cards to keep you on track as you deliver your toast, but practicing your toast as the wedding draws near will boost your confidence and make you more comfortable once you have the microphone in hand. · Stay appropriate. Humor adds a lot to wedding toasts, but make sure to clean up any humorous anecdotes so they can be shared with all wedding guests, including kids. In addition, avoid stories that, while humorous, may end up embarrassing the bride and groom. · Share well wishes. Before you raise your glass and ask guests to do the same, express some heartfelt well wishes for the bride and groom. Doing so is a fitting end to a tradition that’s meant to highlight the special relationship brides and grooms have with their maids of honor and best men. Maids of honor and best men making their first wedding toasts may be nervous in advance of the big day, but there are ways to calm those nerves and deliver heartfelt, memorable toasts that will be remembered for all the right reasons.